We welcome you to our biggest event of the year, the Ace of Herts, which is a round of the South East Orienteering League. It’s not just for experts, there are courses suitable for everybody and help for newcomers. Location Ashridge Estate, National Trust, Moneybury Hill, Ringshall, Near Berkhamsted, Hertfordshire, HP4 1LT (SatNav reference). The entrance to Monument Drive and the Estate Visitor Centre is off the B4506 between Berkhamsted and Dagnall. Assembly is in the field behind the Estate Visitors Centre. Terrain Ashridge is a fine area of gently undulating deciduous woodland with a steep scarp slope to the west containing some areas of contour detail. The latter is only visited to any extent by the longer courses. The going is generally very fast with some limited areas of denser woodland. There are a few small areas of brambles or denser vegetation that are not marked on the map, but these can generally be avoided. Even before recent snow, the bracken was already low and should not impede progress. The major and large paths can be very muddy, making straight routes through the forest more attractive. Notices asking the public to stay on the paths because of deer management activity can be ignored and there will no such activity on the day of the event. The area is much used by walkers (many with dogs and/or buggies) and horse riders. Please be considerate to them to help ensure our continued access to this area. We would like to thank the National Trust, and Ashridge Estate in particular, for access to this excellent forest. Parking Parking has been an issue, due to the numbers anticipated and the expected weather which has rendered non public parking areas unavailable. Early parking will be alongside Monument Drive closest to the entry point from the B4506. This parking is shared with the public and in order to minimise our impact on their use of the estate we will require all orienteers to follow our parking marshalls instructions. The National Trust has placed restrictions on numbers parking at Monument Drive; we ask that everyone consider ride sharing as much as possible. Once the allocated parking area on the drive is full we will be using an overflow carparks which are around 20-25 minutes walk to the start. If you are required to use an overflow carpark you will be informed as you arrive at Monument Drive and will be directed to the appropriate place. There will be a punching start so if you are delayed due to the use of overflow carparks, please inform the start officials and an alternative start time will be found for you. Courses There will be a Free String Course situated in the woods to the north-east of the Bridgewater Monument. 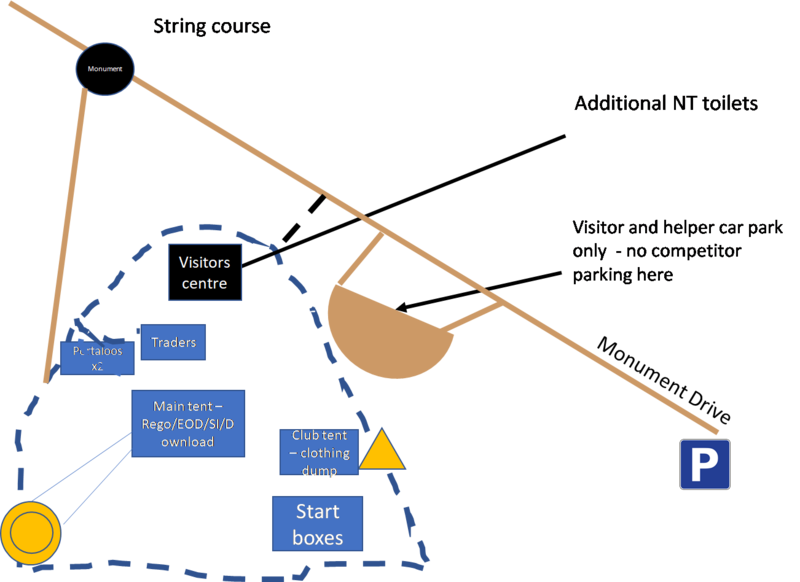 The String Course start will be signposted and is a flat walk of about 150m from the assembly area. Course Notes The White, Yellow, Orange and Very Short Green courses remain entirely south of Monument Drive. All the other courses cross the drive twice. The drive is straight, traffic is restricted to 10 mph, visibility is good and we have placed signs warning drivers of the presence of runners. You should, however, exercise care when crossing the drive. The public roads surrounding the area are out of bounds during the competition – they are marked as such on the maps and very rarely offer the best route choice. The Short Brown, Brown and Black courses include loops – remember to punch the common control at the beginning and end of the loop. The finish is on a path much used by walkers and other visitors. Once you have finished please move into the adjacent field containing the download marquee to continue any discussion of your run. Maps and control descriptions The map scale for this event is 1:10,000 with a 5 m contour interval for all courses. The area was resurveyed by Susan and Keith Marsden in spring 2018 and final updates added in January 2019. Some small seasonal animal tracks are not shown, nor are rootstocks, timber stacks, small fenced enclosures surrounding one or two trees, or branch hides. Thickets shown are generally (but not exclusively) rhododendron or holly. All the courses from White up to – and including – Blue are printed on A4 maps, which have no legend included on the map. The map is drawn to ISOM 2017 standards, so you should familiarise yourself with the symbols used (https://www.maprunner.co.uk/map-symbols/). The Short Brown, Brown and Black courses are printed on A3 maps, which include a legend. The Black, Brown, Short Brown and Blue maps are printed double-sided; all the other courses are on single-sided maps. All the maps are printed on waterproof paper. Control descriptions are included on the maps and loose copies will also be available in the start lanes. For the White, Yellow and Orange courses the descriptions will be provided in both textual and pictorial format. All the other courses will have pictorial descriptions only. The White and Yellow maps will be available at the start. String course There will be a free String Course situated in the woods to the north-east of the Duke of Bridgewater Monument. The String Course start will be signposted and is a flat walk of about 150m from the assembly area. Starts Start times between 10.00-12.30. Courses close at 14.30. Start and finish are within 100m of Assembly. Call up at -4 minutes. Loose control descriptions will be available in start boxes, pictorial for light green and up, choice of pictorial or text for orange and shorter. Longer courses have a control description length of ~19cm, please plan accordingly. White and yellow maps available at pre-start. Start times will be allocated, including entry on the day. Late starters will have a punching start but may have to wait a while on popular courses. We will be enforcing the 4-minute gap between club members required by the SE League rules. Entry & Fees In advance through Fabian4. Closing date 17 Feb 2019. Late entries can still be made up to 21 February 2019. Late entries and EOD are both subject to map availability. Punching Sportident dibber hire £1.00. Charge for lost dibbers £30. Facilities Toilets, First Aid, clothing dump at Assembly. You may also use the toilets at the rear of the Visitors Centre but please do not enter the building with metal spike shoes. An O-Kit trader is expected to attend.Refreshments of a high standard are on offer at the Ashridge Estate café at the Monument near Assembly and there will be a coffee/tea vendor in the visitors carpark. However you should consider bringing your own refreshments as these facilities are also used by the public. Assembly In the meadow behind the NT Visitors Centre within sight of start and finish. Start times of pre-entered competitors so you can check your start times, entered course, and the dibber number you entered with. Live Results and splits updated every few minutes. Live SplitsBrowser also updated every few minutes. There will be no printed / posted results on the day but we hope to have a couple of tablets / PCs available near download for those without their own to check their results. Full results will be published on www.herts-orienteering.club and Routegadget as soon as possible after the event. Event cancellation Given the time of year, extreme weather conditions such as high winds or significant snowfall could result in late cancellation of the event. Every effort will be made to inform competitors as soon as is possible after a decision has been made – if cancellation is necessary a message will be posted on the www.herts-orienteering.club website and an email sent to all those entered on Fabian4. Dogs Dogs are permitted in the assembly area on leashes but are not permitted to accompany runners on courses. Climbing of fences is strictly forbidden. All competitors travelling alone are advised to leave something of value that they will not forget at Enquiries (e.g. car keys) together with name, club, and emergency contact. All competitors are advised to carry a whistle. In the event of extreme weather on the day, cagoules may be compulsory and you will be informed by car park marshals and in Assembly. Come prepared. Ponds and marshy areas may be deeper and muddier than you think. Many of the paths are also very muddy at this time of year and therefore appropriate footwear must be worn by all. The area is popular with cyclists, dog walkers and horse riders. Please show them due consideration. Medical Despatch First Aid will be available at Assembly. The nearest hospital is the Luton and Dunstable Hospital Trust, Lewsey Road, Luton LU4 0DZ, 9 miles from the event. Maps will be available at enquiries.